Buying pet food in bulk is the most practical way to go as it can help you save more money. So if you have a large bag of pet food, storing it in a proper place can spare you from headaches due to messes and bugs infestation. 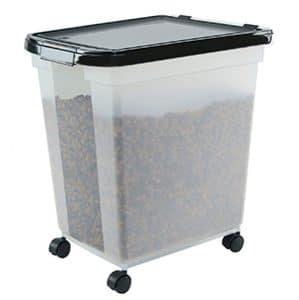 In our top 10 best pet food container in 2019 reviews, we feature our favorite products in the market in this category. Take a pick from these items and eliminate the difficulty in choosing from a selection of pet food containers. 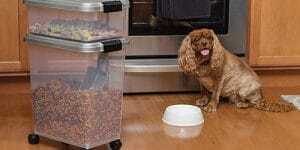 When buying a pet food container, the first thing to consider is the size and dimension. Is it large enough for your bag of pet food? You should be able to find a wide range of containers in different sizes, and it is only a matter of finding the right one that specifically matches your needs. Another thing to look into is the sealing mechanism. 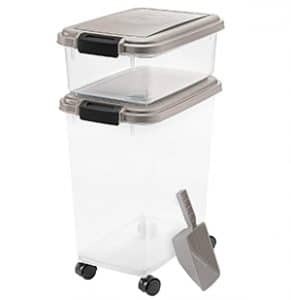 A container with an airtight seal is the best way to go as it prevents the food from going rancid while securing the food from ants, roaches, and other pests. Lastly, a container that comes with wheels is another smart choice to consider. This way, you can just wheel the container around from one place to another instead of lifting the whole thing. Now that you know some of the features to consider in a pet food container, it’s time to go check out the options in store for you. 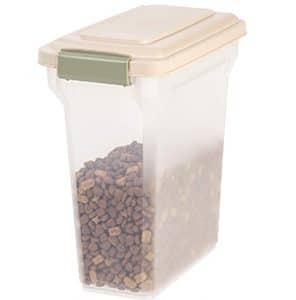 Take a look at these top 10 best pet food container in 2019 reviews and spot the perfect item that matches your needs. 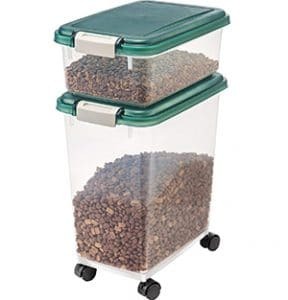 Sealed tight and spacious, this pet food container from IRIS is a great choice for you. It comes with a snap-tight and airtight seal latch that keep the food fresh. No humidity and moisture can get in, and even pests stay out in this airtight sealed pet food container. You can choose from four sizes available, depending on your preference. BPA-free, this container does not change up the flavor of the food and keep it great-tasting for your pet. We think that this is a good size for a pet food bag. However, the seal has a foam material to it, and it has a tendency to get chewed up by ants. When this happens, this would be the end of the airtight seal of this container. It would be best if the material is silicone or good quality rubber. Made from brushed stainless steel, this container is as durable as how you want it to be. It has a smooth and elegant feel to it, and the sturdy exterior keeps the food safe inside. Even if your large pets attempt to knock the container down, it should be able to resist it well. If you have limited floor space at home, there should not be any problem storing this container because of its slim design. 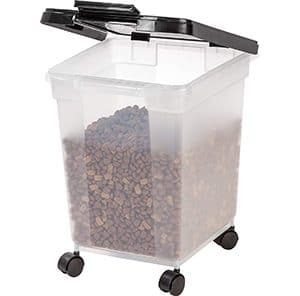 At 25-liters, this container can hold at least 27 pounds of pet food without a problem. If there is one thing we would change about this product, it would be the material used for the bottom part. Unfortunately, it is plastic, so that attracts pests such as roaches. But other than this issue, we think the container works well. 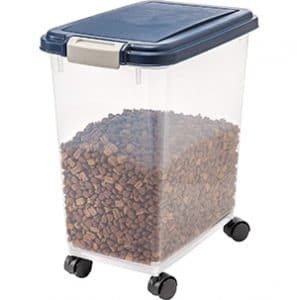 With this pet food container, you don’t have to worry anymore about where to store such a big bag of food for your pet. It can accommodate a 50-pound bag easily, and you can simply lock the lid tightly. The airtight design prevents humidity and moisture from getting into the container. There are also latches that snap tightly, and we like how the container comes with a clear design, allowing you to quickly check if the food needs refilling. No need to open the lid to check if it’s time to shop for pet food! For the most part, we like how this container is built. The body is sturdy and the lid seals tightly. Just one comment about this product, though. There was a complaint about the wheel breaking and falling off after a while. Just be careful when wheeling it around to prevent this issue from happening. Otherwise, it is a good container for pet food. Why get one when you can have two containers stacked on top of each other? This combo of pet food container comes with a 12-quart and 33-quart storage that’s sealed and ideal for storing food for your pets. It is made from BPA-free material, which maintains the freshness of the food for a long time. With wheels on the bottom, transporting the container from one point of the room to another becomes easy. It is definitely a functional food container that you can rely on for a long time. Just as how the product is described, it is without a doubt sturdy and strong. The wheels work great and stay as sturdy as it can get. But the clasp could use some more tightness to it since it does not quite hold too well. This pet storage is as airtight as how you want it to be. It keeps the flavor sealed in, so there’s no pet food smell in your pantry at all. The container is also made from heavy-duty material that’s BPA-free and food grade. With a tight seal, you can be sure that the flavor stays great and does not get rancid too quickly. One thing that we noticed about this container is the slight issue with the size of the container. It claims to be 40 pounds but after putting in a 30-pound pet food bag, it already felt a little crowded. 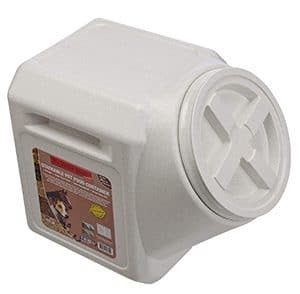 Whether you use this container for pet food, kids’ toys, or other items, it should not be a problem at all. It has plenty of room for items as much as 20 pounds. The material used is sturdy and BPA-free, keeping the contents fresh inside for a long time. We also like the spout for ease in pouring the contents out. Most of the things about this pet storage work – from the size, design, and material. It would be better if the seal is airtight, though. While it seals relatively tightly, it’s not airtight, unfortunately. 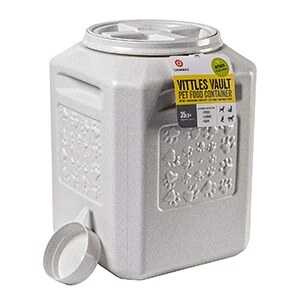 A popular brand for pet food containers, IRIS makes high-quality storage for dry food for pets, as well as other items to keep your home organized. We appreciate the good quality material of this container, as it is indeed sturdy and built to last. It is spacious, the lid is easy to open, and seals great. You can use this product for various items in the household. Perhaps one issue with this container is how it tends to lose the tight seal after a while. The rest of the storage remains the same, but the seal is just not too tight after several months. If you need a reliable, sturdy, and spacious storage for pet food, this one has to be it. Vittles Vault is the best option you have with the right features you need. The lid opens easily and can be closed tightly. We like the lock-down design double gaskets, as well as the molded handles offering a comfortable grip. With food-grade materials for the container, this should keep the flavor unchanged while ensuring the health of your pets. The seal is tight, which is great. But then the lid has a tendency to not screw in easily. So that can be a bit of a challenge closing it. The inside also has some indentations and ridges, making it a bit of a challenge to scoop the whole thing out. 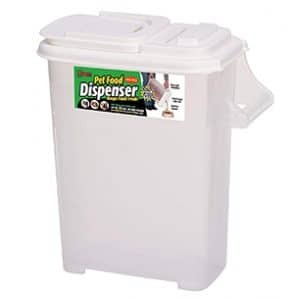 When it comes to pet food containers, this product from IRIS is a good choice for you. It has an airtight and humidity-free design that keeps the food fresh at all times. There is a latch that snaps tightly, keeping the food free from moisture and pests. Lastly, we like the wheels that make it easy for moving around without the need to lift the heavy container. Overall, this product works for the purpose it serves. But we would want to see the hinges positioned on the back portion of the lid a bit more secure as it is. The hinges seem rather flimsy, so you need to be careful to not break it. We’ve reached the number one spot for pet food containers, and this item is in this spot for a reason – it works perfectly well! The lid seals super tightly, and the snap lock keeps the food free from bugs and moisture. Another additional feature to this item is the free scoop, so that allows you to measure the food without a hassle. BPA-free, food-grade, this is an excellent pet food storage worth buying. There is no doubt about the stability and sturdiness of this product. But just one word of caution – be careful when closing the lid and check if it aligns correctly. Otherwise, it will not create an airtight seal, thus allowing moisture to set in. Shopping for a great pet food storage is made easy with our buying tips and reviews on the different items sold in the market today. 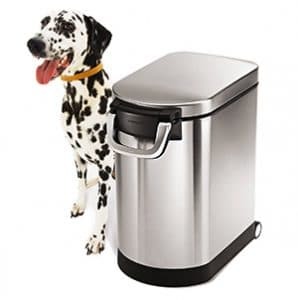 We hope that now, you have come up with a practical decision on the item to purchase after reading our top 10 best pet food container in 2019 reviews to guide you.